Melt the chocolate in a thin-sided bowl over a gently simmering bain-marie, stir until smooth, set aside. Place the butter in a bowl, whisk in the sugar and salt. Add the eggs one at a time and continue to whisk until the mixture becomes lighter in colour. Stir in the quark and chocolate, mix in the rhubarb. Mix the flour, dessicated coconut and baking powder, stir into the sponge mixture, transfer to the prepared tin. Approx. 65 mins. in the lower half of an oven preheated to 180°C, cover the cake with foil after approx. 45 mins. Melt the chopped chocolate in a thin-sided bowl over a gently simmering bain-marie, stir until smooth. 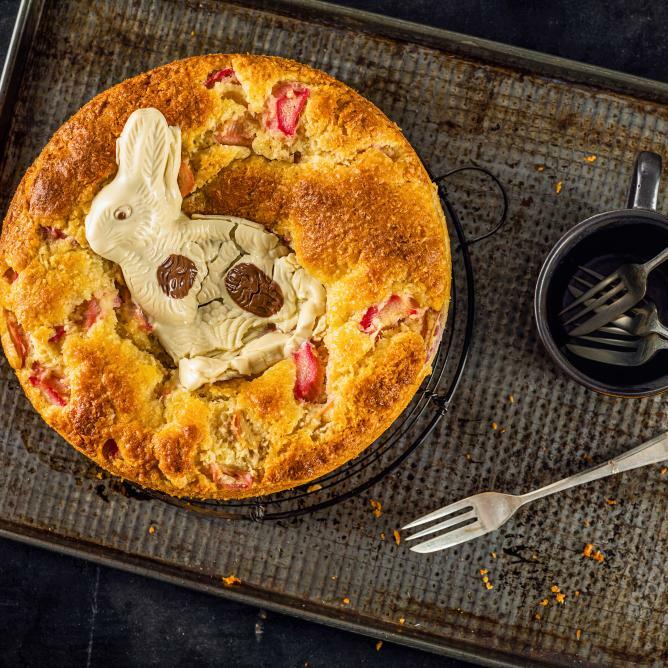 Remove the cake from the oven, spread with the melted chocolate, place half of the bunny on top and bake for a further 2 minutes. Remove from the oven, allow to cool slightly, remove the tin frame, slide the cake onto a cooling rack and leave to cool completely. Instead of white chocolate, use left-over Easter bunny chocolate.